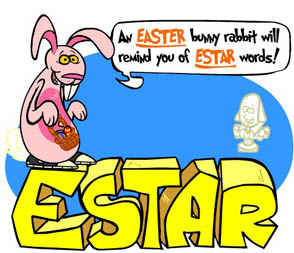 ESTAR - the most important verb in Spanish. ESTAR is a Spanish word for 'to be'. It is the most important verb in the Spanish language, and is the most sought after for its conjugations in terms of number of searches on the internet. SER means 'to be' in the sense of WHAT something is. What are its inherent characteristics, its true being, its character. If you can grab and understand these two differences early you will have much less trouble in understanding the differences. These two verbs confuse the living daylights out of many students of Spanish. Read the two sentences above again ten times, and write them down, because they explain the fundamental differences between the two verbs. Once you understand that we can go on to flesh out the details of what these concepts mean. But as you learn the details you can keep returning to the two above concepts which summarize the differences. The Best Tools for learning the differences between SER and ESTAR! The best option is for serious students of Spanish and involves buying the excellent and thorough 220 page book on the topic 'Spanish Verbs: Ser and Estar - Key to Mastering the Language' by Spanish teachers Juan and Susan Serrano. It is published by Hippocrene Books, New York. The second best option is the interactive computer course (...prepare for a shameless plug for one of our products ...) ... 'Understanding Ser and Estar'. This course uses cartoon characters to make it easier to understand and remember where and when to use which verb. Cartoons of a SER-pent will help you remember 'ser' useages, and cartoons of 'EaSTAR' bunnies will help you remember the useages of 'estar'. TENSE (horizontally) through the pronouns, which is the normal way that students learn verb tenses. Learning the drills vertically (which is less commonly taught due to the tendency to teach tense by tense) will teach you the different endings for each pronoun, deepening the depth and breadth of your knowledge of the verb. By learning the whole verb table you will be exposed to ALL the different words for the different tenses (called conjugations) very early. be! - está! esté! estemos! estad! estén! don't be! - no estés! no esté! no estemos! no estéis! no estén! Don't worry if you are not too sure of the exact use of each tense. You can use these words anyway, and they will help you with consolidating any knowledge that you already have. Start with the simple tenses, then the compounds. Memorize them, and many teachers will be astounded that you can recite so called 'complex tenses' at an early stage of your learning. BE careful of the 'Temporary and Permanent' explanations of the differences between SER and ESTAR! ...will give you the core understanding of the differences. As you learn each detailed case you will see how it slots into the two categories. One of the things that the Serranos explain in their book is that many students are taught the differences between these two verbs by stating that one is for 'temporary' things and one is for 'permanent' things. They argue (... and remember these guys have both taught Spanish for decades ...) that this explanation is part of the root cause of the biggest stumbling blocks to understanding these two 'troublesome' verbs, as they call them. This is a very big topic ... and more is covered elsewhere on this site ... but only some hours of comprehensive study will really allow you to cover all the bases. - We are on a diet. - I am not in the mood for joking around. Do the verb table every day for a week to consolidate your knowledge of it. There is a growing list of fully conjugated Spanish verbs like estar here. Check out our DAILY SPANISH VERB lessons also where a new fully conjugated verb appears on the webpage - 365 days of the year. Doing these every day will really consolidate your knowledge of Spanish verbs. You can learn the details of each tense in more depth as you progress. The more often you do our Verb Tables for each family of verbs the more they reinforce each other. Do a verb table in full each day. (More if you can ...) Each takes about 3 minutes. To get advised AUTOMATICALLY (free) of all updates and changes to this website click on one of the little buttons like the one labelled 'RSS' in the yellow box titled 'Subscribe to this Site' at the top, left of this page. A text message gets sent to your computer whenever there is a new webpage, blog or comment on the site, telling you what change is, and offering you a link to it. This allows you to keep up to date and not miss any new webpages. Spanish Learning Made Fun, Fast and effective.